The Royal New Zealand Ballet presents Speed of Light, the New Zealand premieres of three larger-than-life contemporary classics that will showcase the energy, precision and charisma of New Zealand’s national ballet company, under the artistic leadership of Francesco Ventriglia. Andonis Foniadakis’s Selon désir, a work inspired by the monumental opening choruses of the St Matthew and St John Passions, was created for Geneva Ballet in 2004. A gorgeous synthesis of colour, light, music and movement, the RNZB is excited to share this special work by one of Europe’s most dynamic choreographers, with New Zealand audiences. Described by The Guardian as ‘the work that changed ballet for ever’, these will be the first New Zealand performances of William Forsythe’s In the Middle, Somewhat Elevated. Commissioned by Rudolf Nureyev for the Paris Opéra Ballet in 1987, for a virtuoso cast of young stars, it is a profound honour, and a great thrill, for the RNZB to perform this work. 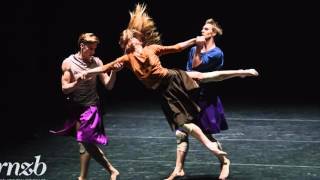 Alexander Ekman’s Cacti has taken the dance world by storm since its premiere in The Hague in 2010. Combining daredevil virtuosity and split second timing with a playful wit, Cacti, in which the dancers of the RNZB will be joined onstage by the New Zealand String Quartet, is a celebration of physicality and the sheer joy of dance. Speed of Light will feature in the New Zealand Festival and Auckland Arts Festival in February/March 2016.